London: London commuters were left in a flap on Thursday when a swan waddled onto train tracks blocking the line to Waterloo station, a transport hub currently undergoing a huge revamp. "New - Due to a swan on the line, some lines are blocked between Egham and Ashford," operator South West Trains wrote on Twitter at 7:14 am (0614GMT). The unexpected rush-hour interruption dismayed many on the social media site, with one person suggesting the driver should "just run it over". "How long does it take to remove a Swan???? Not exactly an elephant is it?" another asked. 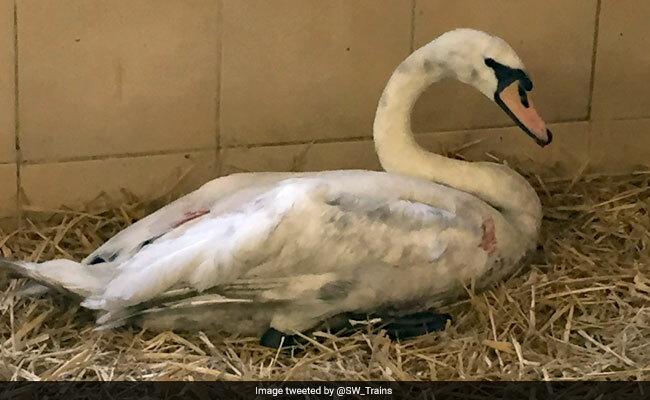 It was more than 20 minutes before the trespassing bird was taken to safety, delaying trains, with South West Trains later posting a photo of the dishevelled swan with dirtied feathers. Commuters have already been advised to avoid Waterloo for most of August, with the rail operator advising them to take holiday or work from home, as a massive station upgrade gets under way. While the 800 million pounds ($1 billion, 883 million euros) revamp has been well publicised, including the expected delays, there was doubt that the swan tale would be accepted by employers. "You expect my boss to believe that?" wrote one Twitter user. Swans have a notable place in British history, with the monarch in the 12th century claiming ownership of all mute swans in England to ensure a supply of meat for banquets and feasts. Queen Elizabeth II only exercises her right over certain stretches of London's River Thames and its tributaries - and the royal family no longer eats the birds. Just hours after the swan incident, South West Trains reported a line near the south coast had been blocked by cows. "We hope to have them moooved soon," the rail operator joked.